REDWOOD CITY, Calif. – September 20, 2011 – DICE, an Electronic Arts Inc. studio (NASDAQ: ERTS) today announced that the Battlefield 3 multiplayer beta will open to all gamers on September 29, 2011. Players from around the world will have a chance to experience the game that industry critics have hailed as the ‘Best Online Multiplayer Game’ before it ships on October 25, 2011. The beta is set in Paris on the Operation Metro map, where players work their way from lush parks on the outskirts of the city to a dark, bombed-out metro station, to the vibrant streets around the Paris stock exchange. Two elite tactical units square off in the series’ popular Rush Mode. One side takes the offensive by attacking M-COM stations while the opposing squad defends and protects. For more information about the beta, players should visit battlefield.com/beta or follow @Battlefield on Twitter. The Battlefield 3 multiplayer beta will be available for the PlayStation 3 computer entertainment system, the Xbox 360 videogame and entertainment system and PC. Gamers who pre-order the digital PC version of the game at Origin (powered by EA) will be granted early access to the beta starting on September 27, 2011. In addition, all customers that pre-ordered a Limited Edition of Medal of Honor will also receive early access to the beta starting on September 27, 2011. 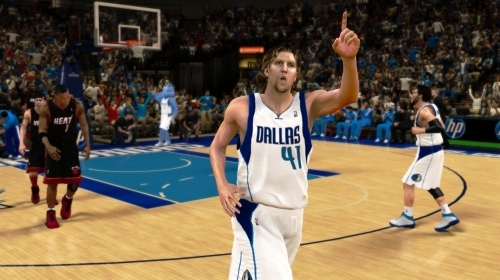 Out now for the Xbox 360 (will be able to queue up the download here) and having arrived this afternoon for the PS3 is the demo for NBA 2K12 which features a rematch of the NBA Finals with the Miami Heat at Dallas Mavericks. The demo is 1.11 GB and structured with a single four minute quarter with the user locked to the Mavs, lacks options to change difficulty or sliders or camera angles, and has had commentary stripped out. EA Sports has just announced details on the upcoming demo for Madden NFL 12. The demo will feature a rematch of last season’s NFC Championship game with the eventual Super Bowl Champion Green Bay Packers against the Chicago Bears in Soldier Field with five minute quarters but commentary stripped out. Keep in mind that rosters will be completely outdated as it will include the base rosters which were set before free agency and other transactions opened this week. The demo will arrive on Tuesday August 9th for both the Xbox 360 and PS3 which coincidentally was the original release date of Madden 12 until it was pushed back to August 30th.